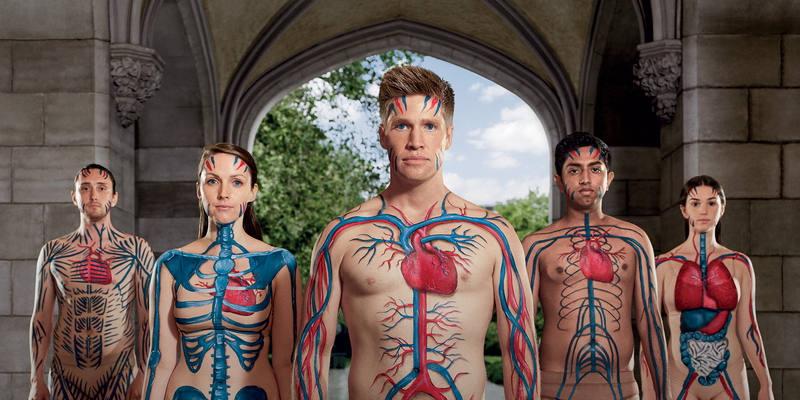 Past Galen Co-captain and 2010 graduate Andrew Feehan is currently featured in a new University of Melbourne campaign to promote medicine, dentistry, nursing, physiotherapy and optometry courses. Pictured front and centre before four other students, Andrew was painted by a make-up artist for almost six hours to show the inner workings of our bodies. View the short interview video below to see what Andrew has been up to recently. Andrew’s relationship with the University of Melbourne began when he was in Year 10, gaining entry into the Kwong Lee Dow Young Scholars program saw him making regular visits to the University and benefitting from tutoring and seminars. For more information about Andrew’s university experience, visit The University of Melbourne website.